The 25-year-old Ghanaian-Belgian Gloria Boateng grew up in the vibrant Ghent. A born artist, who from childhood found that she could please herself and others with music. It started with a toy piano which she later exchanged for a mic, but its purpose: getting her message across, remains intact. She quickly realized that music and emotion are inextricably linked together. The logical consequence being that her music remains a healthy stress release. Her roots and life are an important source of inspiration which she translates in sensitive, rhythmic texts. Making music is a passion for Gloria, sharing it with the outside world is a dream! Her pure raps make her the artist she is today, but she is better described as a singer-songwriter who takes influences from soul and hip-hop to rock and drum and bass. Not only this versatility, but also the energy she exudes on stage, make Gloria a welcome sight for collaboration. As a female hip hop prodigy she has been able to share the stage with names including Nneka, Macy Gray, Selah Sue, The Roots and The Opposites. 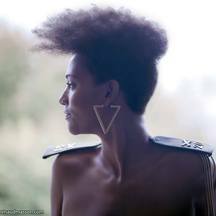 Together with the Antwerp funk and afrobeat group BRZZVLL, she also opened Couleur Café. Her collaboration with the Ghent punk / electro group Waxdolls, gave her a fresh perspective on the contemporary music scene. She also participated in several music competitions; “Vi.be on air" which she won on Studio Brussel and she reached the final of Humo's Rock Rally 2010. With this bounty of experience it is now time for a first EP / single. An EP which introduces you to a new Gloria. On this particular record she doesn’t just focus on her raps but her vocals as well. She continues to discover herself and evolve. Recently, she has also been responsible for her own productions which gives everything an even more personal touch. In short, a must-see artist!